It was probably my rooting interest in Tim Tebow that kept me from seeing the Peyton Manning situation clearly. I honestly didn’t see Denver coming. There was no way Manning would opt to play in Tebow-Town, USA. Not unless….. He wants to play for Elway and Fox? He likes their O-Line? He wants to stay in the AFC? Ha! Nope. What fits better than anything? Dollars. Many, many, many dollars. And boy, did the Broncos pay a lot of them – through the nose and right out the hooves. Apparently neck surgery is good for business. The consensus opinion of experts is that the deal made sense for Denver. Color me confused. Peyton is turning 36, didn’t play a snap of football in 2011, and carries huge health risks – yet he’s going to make more money than Tom Brady? Meanwhile, a healthy, 33-year-old Drew Brees can’t get a long-term deal with a franchise he rescued from oblivion, even after dropping a season of 5476 passing yards and 46 TDs? For the sake of argument, let’s assume Brees’ best days are behind him. I know that’s a little crazy, since his numbers trended upward last season, but it’s not that crazy if you consider what tends to happen to athletes approaching their mid-30’s. Things like “multiple neck surgeries” tend to happen. It’s much safer and more sensible to drop the franchise tag on a guy like Brees. Doing so is a prudent way of handling a looming contract of that size, for a player of that age. The Colts weren’t so fortunate as to have the franchise tag option with Manning. Neither were the Broncos. 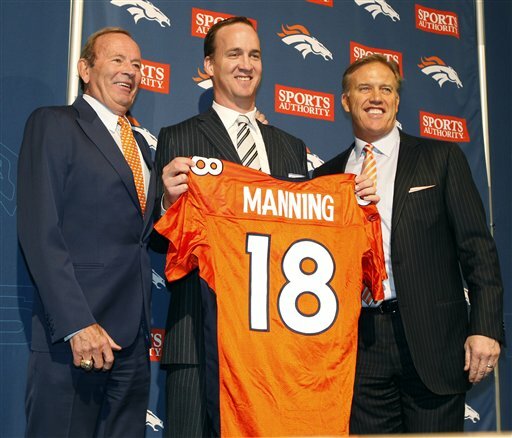 Manning held the golden ticket of free agency and got paid off. (And so, too, may Brees, depending on how ugly things get with a potential holdout). But as crazy as I think Denver was to pay mile-high cost for mile-high risk, I think they were even crazier to do so given that they already had Tim Tebow. Denver was in a great position. They had a talented, up-and-coming quarterback who just delivered the franchise’s greatest moment in 13 years. Tebow is young and he is improving. He galvanized the fan base. He sold jerseys. He said all the right things and did all the right things. He was (and is) a one-of-a-kind personality. The guy could have been an icon in Denver. Time will tell if the Broncos made the right move, but at this time, I’m thinking they didn’t.